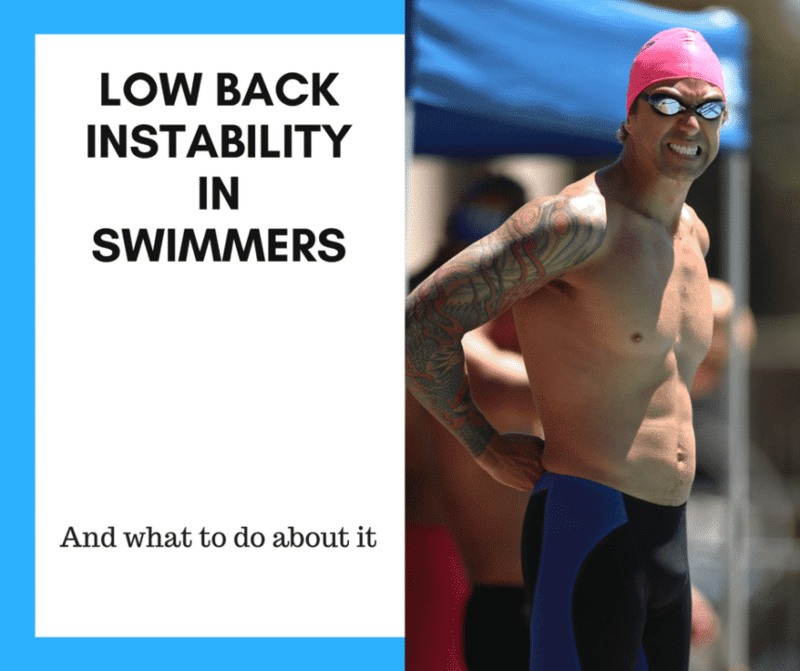 Low Back Instability in Swimmers and What to do about it! Excessive low back movement is directly correlated with low back pain. Excessive shoulder range of motion directly correlates with shoulder pain. Excessive ankle mobility directly correlates with ankle pain. Therefore, learning how to control these joints and providing adequate stability at each segment is essential. How does a coach even know if an athlete has excessive mobility? I recently received an e-mail from a 3x Olympic Coach coach asking about instability. There are tests to find if an athlete has excessive mobility: Beighton score. Hypermobility is a double-edged sword. In certain areas, hypermobility is beneficial and necessary to force production. For example, a swimmer is able to grab more water with an early vertical forearm when they have a greater internal rotation at the shoulder. However, too much range of motion at specific joints leads to instability. Addressing this fine-line is essential, but fragile. When I was working with Sun Yang, ensuring he had enough stability at his shoulder girdle to keep his shoulders healthy was essential for elongating his elite level. The same holds true for the low back. Many push swimmers to utilize more range of motion at the low back, especially during dolphin kick, to increase force production, but the low back minimally contributes to flexion and extension. Forcing excess movement at this joint exacerbates mechanical low back pain, the most common type of low back pain in athletes. Improving stability at these joints is essential for injury prevention. Therefore, preventive exercises which use a full range of motion are required, however being able to stabilize with no movement (isometric) is key first. Once this is achieved, then a swimmer can progress to more range of motion. We often work on speed and explosiveness, but stability with no movement is an essential baby step many elite athletes (Olympic swimmers to NBA players) bypass. It is essential for the athlete with hypermobility to obtain strength through their whole range of motion. The Beighton score should be a small part of an athlete’s annual, or better yet quarterly, assessment. Screens performed on all elite swimmers to determine tight, loose, weak, hyperactive areas for injury prevention and sports optimization. These screens should be done by an outside party, then coordinated with the coaching, as biases occur for coaches, strength coaches, etc. During this, stability, mobility (hypermobility) testing is possible. Lumbar segmental instability is believed to be the source of pathomechanics responsible for “mechanical low back pain”. Panjabi describes 3 components that are responsible for providing stability to the spine. Integrating these subsystems is important for normal motion and prevention of faulty mechanics. If one subsystem fails the other subsystems will have more stress placed on them to compensate. Having proper muscle length, strength, and timing is essential to prevent the passive structures from being excessively stressed. If the disc, facet joints, and ligaments are excessively strained due to poor motor or active control, then your hypermobile swimmer will be sidelined. Kaigle (1995) experimentally produces instability by disrupting structures of the spine. Instability was demonstrated with diminished disc height, removal of facet joints, and disruption of ligaments. Severe disc degeneration allowed the most shearing. Synder-Mackler (1994) has pointed out that not all people who demonstrate hypermobility incur injuries (ACL deficient knees). Therefore those people who can compensate for muscular activity can overcome deficits caused by damage or loss of inert structures. The more mobility by an athlete, the more stability required. Hides (1994) demonstrated that the multifidi adjacent to an injured vertebral segment would atrophy. Damage to any area causes a muscle to atrophy and a loss of control. [An essential reason why addressing aches and pains early is key, injury = weakness]. O’Sullivan (1998) demonstrated altered abdominal recruitment in patients with chronic low back pain. Hodges and Hides (1996) showed that the recovery of multifidi is not spontaneous following an injury to the low back. Shiovan (1993) demonstrated that multifidi remain inhibited following lumbar laminectomies [surgery doesn’t fix everything!]. Dannels (2001) demonstrates an increase in multifidi CSA (cross sectional-area) in patients with chronic LBP (low back pain) who had undergone atrophy. Only noted hypertrophy with static “stabilization exercises”. Hicks (2003) identified 3 clinical tests as being reliable among experienced clinicians for identifying lumbar instability. Prone instability test, Beighton ligamentous laxity scale, and aberrant motion of trunk. IT IS ESSENTIAL TO CATCH THE ATHLETE WITH INSTABILITY BEFORE THEY HAVE THE FOLLOWING PREDICTORS FOR FAILURE! If all of these are caught in this phase, it is too late. As a coach, you can know if a swimmer has aberrant movements and a SLR greater than 91 (or you at least have an idea!). Greiner and McGill (2007) demonstrated abdominal bracing to be superior to abdominal hollowing (specific TA) in producing stabilizing effect on the spine. Bracing improves stability by 32% whereas hallowing improved stability by .14%. Many athletes want manipulations of their lumbar spine. Manipulations have their place, but we’re finding they are more helpful for a specific set of people. Another common treatment is traction for low back pain. Yet, simply performing traction to everyone doesn’t mean it is helpful for each person. There are out of water screens specifically made for land-based sports, Functional Movement Screen. This is a starting point for swimmers, but swimmers use unique movements without the support of the ground. Therefore, a more stroke specific assessment for assessing strengths and weakness out of the pool is mandatory. Moreover, every swimmer must have a specific screen for them individually to their needs. This ranges from stability, mobility, and motor control all the way to training history, injuries, current training, training age, sleep, nutrition, etc. Every swimmer (or athlete) I work with undergoes this screen and an individualized plan. Too often this step is skipped. Exercises addressing these flaws should be administered and dryland should incorporate (not be the only thing) improving these flaws. Too often, teams, have everyone do the same dryland. If a swimmer demonstrates hypermobility, particularly at the low back, a core stability program and soft tissue approach are necessary to keep this area healthy, as hypermobility at the low back is a risk factor for injuries and injuries cause pain, weakness, and derail a career. This individualization is feasible for every club! Making subtle differences to address flaws is mandatory! Make sure your athletes are safe, then provide them the tools to be elite! Do you want to keep your swimmers healthy? Want to make sure you’re getting a specific dryland best for you? 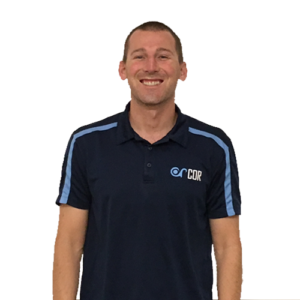 We work with swimmers from all over the World and teams of all shapes and sizes, click here and find out how to work with me today!